People demand to have as much comfort as they can possibly get when travelling, whether they are families going on a vacation, or executives on a business trip. They want to have their energy reserved for all of their carefully planned activities once they have reached their destination. And the Indonesia’s top flag-carrier airline, Garuda Indonesia with its Full Service concept, understands this. Early bookings ensure that travelers get the best offer available. From seating preference to the fantastic travel fare on offer, travelers have the free rein to manage their time and finance. Garuda Indonesia also fully understands the high work demand which sometimes requires business people to take a trip in a short notice. Easy check-in process with either city check-in, Web check-in or phone check-in, and soon-to-be-ready mobile check-in service, can help ease any worry passengers may have when they start their journey. All the available modes of check-in services ensure that passengers can enjoy their flight even hours before the flight. 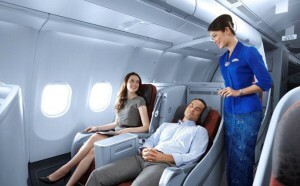 Arriving at the airport, passengers of Garuda Indonesia once again can already enjoy the comfort the airline provides. Garuda Frequent Flyer Platinum and Gold Card holders and executive-class international flight passengers can even complete the necessary the immigration process in the comfort of Garuda Indonesia Executive Lounge, all fully assisted by Garuda Indonesia professional staff. The facilities in the lounge are available for the passengers awaiting their flight. From business center and wireless Internet connection, to reflexology machine to shower, all the facilities ensure that passengers can always have the ultimate comfort when flying with Garuda Indonesia. Ready to cater to all the needs of travelers and more. With its latest fleet of airplanes from Boeing and Airbus, Garuda Indonesia delivers top quality services, making each journey an experience. Some business people sometimes may pay less heed to the services rendered in their travels, having their minds already preoccupied with the business challenges awaiting at their destination. 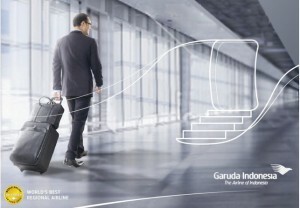 But traveling with Garuda Indonesia, they will rediscover the joy of flying and make the best of their traveling time. With comfortable cabin and ergonomic seat, travelers do not need to stop being productive. Highly-productive business people can easily simulate the comfort of their workplace in flight. Comfortable and ergonomic seat, with spacious leg room, can easily be arranged to provide excellent comfort. And with a power socket as well as a reading lamp installed for each seat, passengers can continue with their aspiring work on their laptops or other electronic devices. Full Service comfort offered by Garuda Indonesia does not stop there. With a highly adjustable flexible headrest, there is no reason why even a business trip cannot provide business people with a chance to take the much needed rest to prepare their body and mind for the work ahead. Garuda Indonesia won Asia Pacific Airline Food Award 2012 further proving how Garuda Indonesia always aspires to make flying with the airline an experience which involves all the five senses. And indulging the passengers’ palate is one of the ways Garuda Indonesia use to help its valuable passengers enjoy their trip even more. From Indonesian cuisine, world-famous for its richness in variety and tastes, to international foods and beverages offered in flight, they are sure to make a lasting impression on the passengers. International passengers heading to Indonesia can enjoy the special comfort of Immigration on Board (IoB) service. With the service, gone is the hassle of queuing at the immigration counter upon arrival as immigration process is done on-board before landing or disembarking at Soekarno-Hatta International Airport, Cengkareng, or Ngurah Rai International Airport, Denpasar. Passengers remain comfortable in their seats while Garuda Indonesia cabin crew conduct IoB service, freeing the passengers to continue with their activities in their seats and enjoying the flight. And in-flight entertainment which caters to just about all preferences is ready to make the journey, even a business trip, much more enjoyable. Tens of choices of movies, music albums, TV shows or even games are ready to turn flying with Garuda Indonesia into hours of fun and relaxing experience. But, even for business travelers, who opt to work during the flight, the accompaniment of soothing music will surely a welcome. Making passengers experience their flight as they would experiencing the richness of cultures and world-famous warmth and grace of Indonesian people has always been what Garuda Indonesia is striving for. As Indonesia’s top flag carrier airline, Garuda Indonesia is ready to meet the demands of the ever demanding international flights, promising to deliver the best quality service to many destinations in Indonesia and abroad. This advertorial was published in The Jakarta Globe on May 15, 2013.